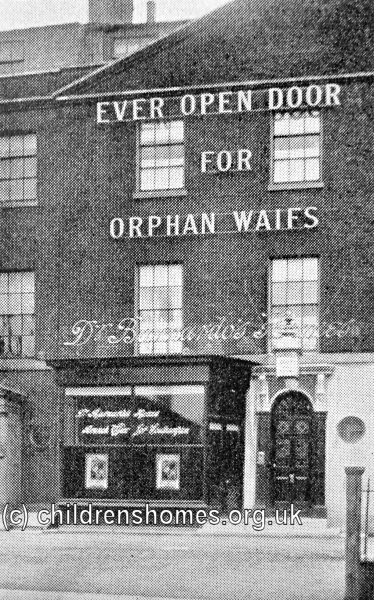 On August 11th, 1902, Dr Barnardo opened an 'Ever Open Door' receiving house at 128 Above Bar, Southampton. It was the thirteenth such establishment to be set up in Britain's provincial cities and followed on from those already opened in Bath, Belfast, Birmingham, Brighton, Bristol, Cardiff, Edinburgh, Leeds, Liverpool, Newcastle, Portsmouth and Plymouth. The Ever Open Door houses, with their slogan 'No Destitute Child Ever Refused Admission', were open twenty-four hours a day and provided short-term shelter for homeless youngsters while consideration was given to their future, which would generally be in a long-term Barnardo's home or emigration to Canada. The Above Bar Ever Open Door could hold up to twelve children, with 15 being the upper age limit for admission. Barnardo's Ever Open Door, Southampton, c.1905. By 1920, the Ever Open Door had relocated to premises at 24 Carlton Road, Southampton, again with the capacity for twelve children. The Carlton Road premises still survive, now a private house. By 1939, the Ever Open Door was located in a house known as Pevensey at 7 Brookvale Road, Southampton. After the Second World War, Pevensey was used as a "shipping hostel" housing boys prior to their emigration to Canada. It then became a hostel for working boys in 1957, finally closing in 1973.